Today was the official release date of Rock Band for the Nintendo Wii game console. However, an article at Joystiq.com shows that the highly anticipated music game is not all it’s cracked up to be. According to the article, the Wii version of the game will be missing some key features that are available in the Xbox 360 and Playstation 3 versions. Instead, the game is apparently going to be similar to the Playstation 2 version, possibly with even less functionality. Despite the Wi-Fi capability built in to every Wii console, the new special edition of Rock Band will not include the “Rock Band Store”, where, among other things, players have the ability to download additional songs for the game. 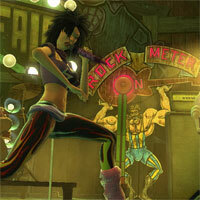 Nor will Wii users be able to create their own Rock Band characters. With the Mii characters being so ingrained in the culture of the Wii, why would Harmonix/MTV games not take advantage of that? Why spend so much time “customizing” the Wii version of the game only to strip nearly everything that makes it fun? Even worse, the guitar peripheral that was sold with Guitar Hero III will not be compatible with Rock Band. Of course, Harmonix/MTV Games pawns the blame for that misstep on Activision, the company behind Guitar Hero. No matter who’s to blame for it, it’s yet another problem for those of us that want to play both games. Rather than being able to use the $80 guitar peripheral that came with Guitar Hero, I’m probably going to have to run out and drop another $80 for another guitar if I want to play a four-player game of Rock Band. After making Wii owners wait nearly a year to get their hands on this amazing game, I can’t help but feel like Harmonix/MTV games is stiffing us. I can only say that I hope Activision will not do the same thing to us when they release Guitar Hero: World Tour. At least when I buy that, along with the GH guitar I got with GH3, I’ll be able to play a four-player game with my friends and family. Although I have not yet purchased this game (and I’m honestly questioning whether I will, knowing full well that I’ll spend another $180-200 whenever GH:WT is released later this year – hoping that the GH offering will offer the missing functionality of RB), I am already sorely disappointed. I’m sure it will still be fun, but it really upsets me that they pulled out so much of the good stuff from the game, again, after making us wait for so long for our own version. For a long time, I’ve been privately griping about the fact that Rock Band is still unavailable for the Wii. I don’t own an Xbox 360 or a PS3, and the only PS2 we have in the house is hooked up in my stepson’s bedroom (when he’s here – when he’s over at his father’s, he drags his PS2 with him). Therefore, as of yet, we’ve still not been able to get Rock Band. That’s one of the few games I’ve really wanted since its inception, especially after I found out how much the whole family enjoys playing it. Now, within three months, there have been three separate press releases involving Rock Band for the Wii.